This graph displays the impotence of the right wing netroots. They don't really exist. They talk a big game, but when it comes down to it, they don't matter. 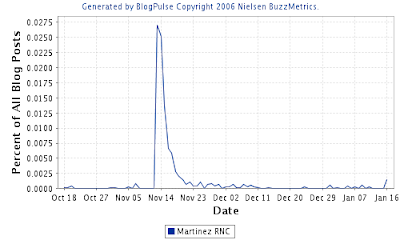 After the President crowned Sen. Mel Martinez as RNC "general chairman" in November, the right wing netroots exploded. Most of all, they were mad that Martinez was a pro-amnesty guy, but it also seemed like there was an impression that we'd entered an era where publically voted positions would no longer be anointed from above. The race for chair of the Democratic National Committee is a perfect example of how the netroots can influence an election like this. This post from two years ago on MyDD is a perfect example of what was going on at the time. There is no parallel on the right wing netroots today. By the beginning of December of 2006, though, all wind was out of their sails of the right wing bloggers who didn't like Martinez. No umbrella organization was created, no altnerative candidate floated. The rebellion against Martinez isn't coming from your wired everyman (like the support for Dean in 2005), its coming from inside the RNC. An insider rebellion, even if it is succesful, will be much different than the organized opposition that came from online Democrats in 2005. Martinez will have a fight, it will most likely be too little, too late, and it didn't come from the netroots.